Week 2 of Round 2 saw the Tahs battle with the rain, as well as the Sutherland Sharks. Sunday also saw the start of the PG’s campaign with an impressive T20 win over Western Suburbs. In a very wet weekend, the Styleness Waratahs ended up coming away with 2 wins, 2 draws and 1 loss against a strong Sutherland outfit. First grade had a great win, bowling Sutherland out for 131 in pursuit of our 348 from a week earlier. Second grade had a late start, which means chasing 341 was very unlikely. They ended the day on 4/169 off 51 overs. Play was abandoned in 3rd grade as well as 5th grade. Fourth grade had a great win defending 184, they bowled the Sharks out for 98. The Sharks lost their last 8 wickets for 23 runs. PG’s had a resounding T20 win, setting 9/131 from 20 overs, Western Suburbs could only manage 9/66 from 18.2 overs. Highlights of the weekend included a terrific 6/17 from 17 overs by Brad Wilson in 4th grade, a pair of 4 wicket hauls in 1st grade by Joel Foster (4/16 off 8) and Michael Visser (4/38 from 16), and finally an 84* off 150 deliveries in 2nd grade by Jack Ritchie. On Sunday, the highlight was Joey Graham picking up 4/8 from 4 overs in PG’s big T20 win. 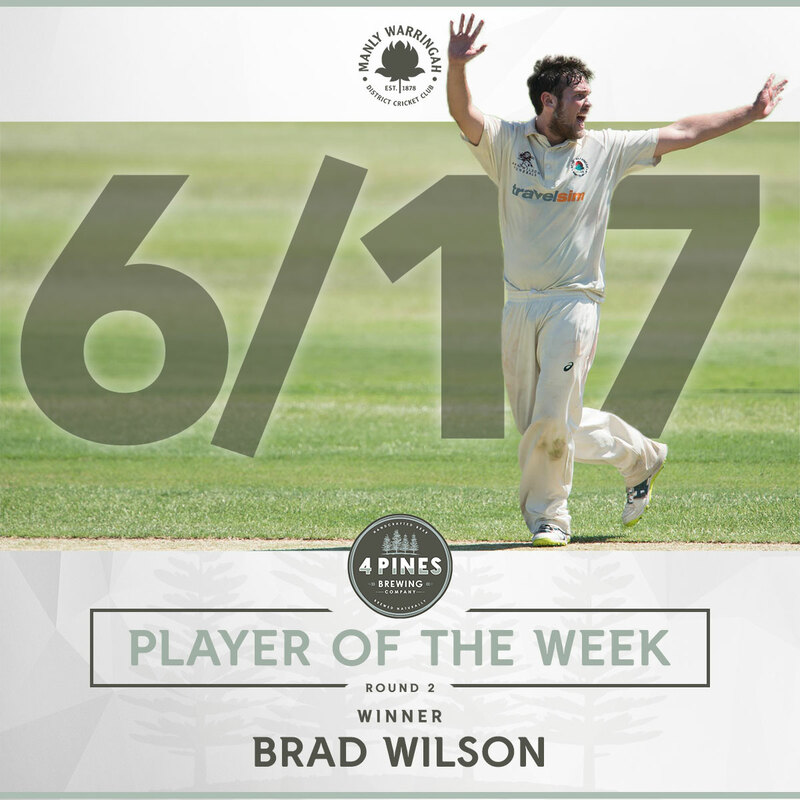 Brad Wilson is the deserving winner of the 4 Pines Player of the Week award, as he dismantled Sutherland’s top, middle and lower order to pick up the incredibly impressive figures of 6/17 off 17 overs, which included 8 maidens. Brad bowled the house down all day, and was thoroughly rewarded after tea as he got a wicket first ball back from the break. From then, he could not be stopped as he ripped through the batting order to seal a great win for the Manly boys. Well done Brad! Hope many more wickets for you this season! We rocked up to Sutherland expecting a washout and pleasantly surprised when we realised we were going to have a game on our hands, with Mickey back from representative honours, he took the new rock with Viss and we made early inroads with Viss taking the first 3 and Mickey keeping it tight from the other end with no one in grade cricket being able to lay bat on ball. Fozzy replaced Mickey ‘Stretch’ Edwards and got the opportunity to bowl to a decent Number 3 stick, and just like that Foz snicked off Steve Smith to have his first. Viss and Foz started getting wickets in quick succession with both boys ending up with 4 for the match, the boys toiled hard with Greeny and SOK showing their leadership from one end whilst we chopped and changed the quickies from the other. On came Jedwards halfway through the second session to finish the game for the boys with 2fa. Great win to get our season off and running and an all round solid performance by the boys. Special mention to juicy for being available this weekend. Rocking up to Manly Oval on Saturday, it was more fitting to have brought your budgy smugglers and flippers than your cricket kit with the whole ground being under water. But after a few hours of deliberation and the sun popping out, we finally got some cricket in. Cubs and Tommy Kaye got things underway with a few boundaries. Unfortunately soon after, Tommy was given out LBW. With Faz and Elliot looking for quick runs they fell for not many bringing Gainsy to the crease. Both Cubs and Gainsy showed grit and fight. They took us to the end of play with a draw. Cubs the highlight of the day finishing 84 not out and Gainsy 34 not out. This will ensure some momentum for next weekend and hopefully kick start our season. No play day 2, match abandoned. he 4th grade boys finished strong to lock the game away from the Sutherland batsmen. It was a day which was sunny despite the rain and the pitch was surprisingly dry. Our bowling attack fought strong in the early overs taking a couple poles. However, the Sutherland defence fought hard with the fall of only a few wickets before tea. Notably, Sam Hole took a ripper in slips with his poor pinky taking a blow and bleeding for the rest of the day. Thanks for Jacob O’Sullivan for filling in while he went to fix it up. Credit to Jesse Moffat with some outstanding work with the ball although only taking 1 wicket. After tea there was a group chat. A pep talk and some firing up from Skid and Gummer (c). We went out firing with Brad ‘Speccy’ Wilson the star taking a wicket first ball back. From there the outstanding fielding and bowling attack took the game away from Sutherland. Brad’s figures ended up as 6/17 off 17 overs which after bowling 8 maidens and putting a lot of effort was an outstanding performance. Also, Jacob Graham put in some quality deliveries to secure a quality 2/9 which sealed the game for the 4th grade tahs. The lads arrived to Pratten Park keen to start a successful campaign. Jack won the toss and the Tahs were batting on a slow deck. Jack and Matt opened the batting and showed good intent early, taking advantage of the power play. A slight mix up in running between wickets and we lost Jack. Matty B continued hitting balls to the fence and working singles. Oli was caught behind for 5, bringing in Foz. Matt and Foz both batted extremely well in the conditions and got us to 70 before losing Matt. Foz left 10 runs later, getting 30 crucial runs for the Tahs on what came out to be a tough deck. The lads struggled after losing Foz, however with some big hitting from Isaiah and Sommers the Tahs got to 131 off their 20 overs. Joel Foster and Hamish Starr opened the bowling and applied the pressure from the word go. Isaiah made the break through in the 4th over and from that point on it was all the Manly boys game. The bowlers gave the Wests batsmen nothing to work with and the lads were bouncing around in the field. Both spinners Joe and Isaiah bowled superbly, with Joe finishing with absurd figures of 4/8 from his 4 overs. Overall a great start to PGs for the Tahs! 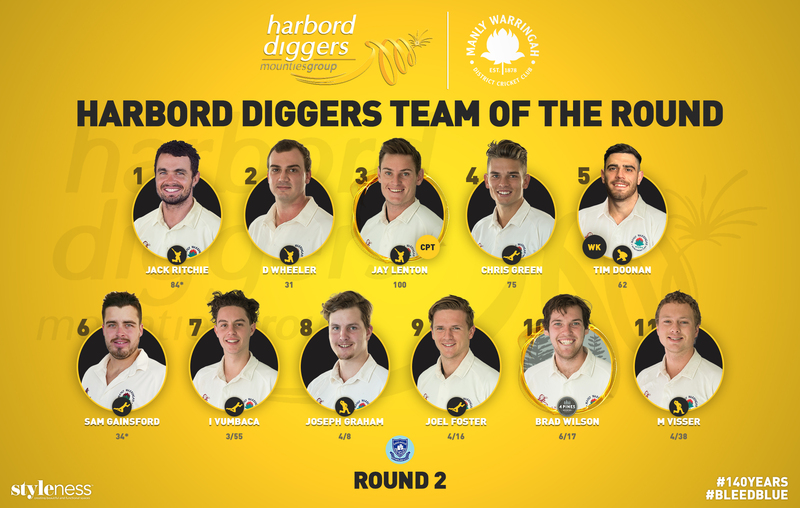 This weeks Harbord Diggers Team of the Round is a very complete team. Jack Ritchie and Dom Wheeler open the batting forming a very solid opening partnership. Jay Lenton is batting at 3 after his stellar 100, Greeny follows after his scintillating 75 and Timmy Doonan comes in at 5 after his impressive 62. Gains rounds out the top 6 after his 34* to ensure a draw in second grade. Izzy Vumbaca and Joey take the spinner roles after terrific performances in third grade and PG’s respectively. Joel Foster (4/16), Brad Wilson (6/17) and Michael Visser (4/38) round out the seamers after they all cleaned up on the weekend.